The first blood test to measure more accurately how fast our DNA is ageing has been launched in the UK. The TAT (Telomere Analysis Technology) test, measures the length of telomeres, the tiny caps at the top of our DNA. It’s already been scientifically proven that the shorter they become the closer we come to the end of life and/or likely to be suffering from life-threatening diseases or accelerated ageing. Until now the only commercially available tests have measured the average length of telomeres – not how many are ageing or the percentage that are getting shorter. The results from the test are used to measure chronological age against biological age, as indicated by the damage to telomeres. The patient would then work with his doctor to correct damage with various lifestyle and diet changes, taking another test in a year’s to check changes. Telomere damage can be stopped and even reversed by making lifestyle changes such as taking more exercise, a healthier diet and vitamins. There are also some substances which are known as ‘telomere activators’ and promote telomorase, the enzyme which helps lengthen them. These incude some anabolic steroids and TA65, a supplement made from a plant source. 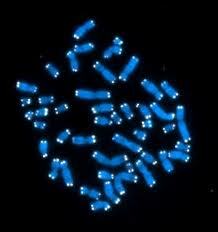 In humans, as cells replicate, the telomere length decreases, as part of the natural process of ageing. But those suffering from diseases will have far shorter than average telomeres which eventually leads to faster or total cell death. The company behind this new development is a new Spanish biotech, Life Length, which has been spun out research by the Spanish National Cancer Research Centre in Madrid and specific work by its Director Dr Maria Blasco. The company has been partly funded by the Spanish government and US venture capital. So far $20 million has been invested over the last five years in developing and refining the technology. The test, at £650 is being made available through doctors in independent practices, who will guide a patient through the process, the results and the changes that should be made to lifestyle. Patients will also be asked, to anonymously contribute to research through a questionnaire to further enable medical knowledge into ageing diseases. The Doctors Laboratory in London, is providing front end sample preparation for Life Length, who will process the blood samples in their laboratories in Spain.. Click here to mail the Doctors Laboratory about tests. Patients undergo a simple blood test through their physician. The blood is then frozen the same day and sent to Life Length’s Madrid laboratory, where a powerful microscope is able to map the numbers of ‘critically’ short telomeres. The process is very complex, involving the ‘mapping’ of every single cell in the blood, which is why is takes a month to get the results. At the London launch, Life Length CEO, Steve Matlin, predicted that while the test was expensive at this time, it could eventually become as readily available as cholesterol testing is today. Matlin, a former US investment banker, has already had himself tested – to find happily that he has a biological age of 37 at the chronological age of 43. After the big ‘fat is bad’ push of the 1980s and 1990s, we are finally coming around to the idea that some fats are good for us. The good ones are Polyunsaturated fats (PUFAs) and Monounsaturated fats (MUFAs). Omega 3 and 6 fats are PUFAs and are classed as essential. Our bodies cannot manufacture these so we need to make sure we are eating foods which contain them. It seems like every day we hear about something else that we should be eating or drinking. So what makes Omega 3 special? We need good fats for a whole host of things – every cell in your body relies on fat to survive. They are essential for nerve, heart and brain health and for nearly all of the body’s basic functions. We seem to have no problem getting enough Omega 6 fat but there is one big catch – Omega 6 fats are dependent on Omega 3 to produce optimal health benefits and are only considered good fats when consumed in moderation. Omega 3 fats have an amazing role in your body as an anti-imflammatory. Consuming them reduces your risks of developing heart disease, arthritis and cancer. It is widely acknowledged to have a pivotal role in the prevention of heart disease. Omega 6 fats, while helpful in reducing bad cholesterol, can promote inflammation within our bodies when too much is consumed – a very undesirable quality. The developed world, as a whole, is extremely inflamed. In the US, diets tend to contain up to 25 times more Omega 6 than Omega 3 fats. Mediterranean diets have long been studied to identify exactly what promotes heart health and longevity. These studies have indicated that it is the healthy balance between Omega 3 and 6 fatswhich leads to a longer and healthier life. People who follow such a diet are much less likely to develop heart disease. The mediterranean diet traditionally contains much reduced levels of meat consumption, which is a major source of omega 6 fats. It focuses on foods rich in omega 3 fats, including wholegrains, fresh fruit and vegetables, garlic, fish and olive oil. Moderate intake of wine also adds something to the balance. If you only take one supplement a day, health professionals are almost all in agreement that it should be a fish oil supplement. Clinical evidence suggests that EPA and DHA (eicosapentaenoic acid and docosahexaenoic acid, the two omega-3 fatty acids found in fish oil) help reduce risk factors for heart disease, including high cholesterol and high blood pressure. Fish oil has been shown to lower levels of triglycerides (fats in the blood), and to lower risk of death, heart attack, stroke, and abnormal heart rhythms in people who have already had a heart attack. If you are sceptical about the importance of these fats, consider the symptoms of someone suffering from a defiency in Omega 3; tiredness, poor memory, dry skin, heart problems, mood swings, depression and poor circulation. Omega 3 fats are highly concentrated in the brain and appear to be important for cognitive (brain memory and performance) and behavioral function. So if you feel like you need a memory or energy boost, you could find your answer in changing your diet just a little bit. If you are on blood thinners or diabetes medication, you should consult your GP before starting to take fish oil supplements. Later this week we will be examining a sinner of the fat world – Trans fats. Paris: French scientists have used human embryonic stem cells to grow human skin cells, a report in the medical journal Lancet reveals. Scientists working for Inserm , France’s medical research agency, treated the embryonic cells and grew them on a matrix, before grafting them onto mice. The cells proceeded to grow into skin. This procedure may be used in medical treatments for temporary cover for burns patients while their own skin is grown, also in a lab, over a period of weeks. London: Scientists at London’s Imperial Colleage have captured the body’s immune cells at work. The mechanism used by ‘Natural Killer’ immune cells in the human body to distinguish between diseased cells, which they are meant to destroy, and normal cells, which they are meant to leave alone, is revealed in new detail in research published in PLoS Biology. Understanding how this aspect of the body’s natural defences works could help medical researchers develop new ways of boosting these defences to treat disease. Natural Killer (NK) cells – a type of white blood cell – are a major component of the human body’s innate immune system. Over 1,000 NK cells are found in every drop of blood. They provide a fast frontline defence against tumours, viruses and bacterial infections, by latching onto and killing cells in the human body that are cancerous or are infected with a virus or a bacterial pathogen. On their journey round the human body NK cells regularly latch onto normal non-diseased cells too, before moving off, leaving them unharmed. Previously, the process by which NK cells made the right decision to kill or not kill another cell was unclear. Now, the team of researchers from Imperial College London have used high speed microscopy imaging techniques to observe the NK cell decision making process in action. This has revealed striking differences in the behaviour of NK cells when interacting with healthy or diseased cells. The outcome of the decision making process is determined by how receptors on the surface of the NK cell interact with proteins on the surface of the captured cell. Every NK cell has two types of surface receptors – activators, which turn the killing mechanism ‘on’ and inhibitors which turn the killing mechanism ‘off’. Professor Davis and his colleagues discovered that if a captured cell is diseased or cancerous, it interacts with a large number of the NK cell’s activating receptors, which makes the NK cell stop dead in its tracks and spread out over the captured cell. During this spreading process the NK cell continuously reads the ‘on’ and ‘off’ signals from its surface contact with the captured cell. If the ‘on’ signals dominate, the NK cell prolongs contact with the captured cell and eventually kills it. Conversely if the captured cell is healthy, it interacts with more of the NK cell’s inhibiting receptors – and fewer of its activating receptors – meaning that the ‘off’ signals dominate and the ‘stopping and spreading’ process does not occur, allowing the NK cell to quickly move off in search of a new target. The research was funded primarily by the Lister Institute for Preventative Medicine and the Medical Research Council, with additional support from the Biotechnology and Biological Sciences Research Council, the Royal Society and the Wellcome Trust. Chicago: Stem cell injections may be able to help reverse the crippling effects of multiple sclerosis, a study published today says. Four out of five adults in the early stages of MS who were injected with stem cells taken from their bone marrow saw an improvement in symptoms after three years, while the condition of the remainer stabalised. MS is one of the most common disabling neurological conditions,and caused by damage to the myelin – a protective sheath surrounding nerve fibres and results in problems with sensation and muscle control. The study, at the Feinberg School of Medicine, was designed to see whether injections of stem cells from bone marrow would migrate to parts of the nervous system damaged by MS and repair them. Among the 21 men and women in the trial,who were aged between 20 and 53, 17 had improved on a scale of disability after three years. None of them reported a worse score. The report in The Lancet Neurology medical journal today says the technique suppresses cells that cause damage and effectively ‘resets’ the immune system. And a further trial involving 100 patients is to get under way soon. Tel Aviv: Brain birth defects have been successfully reversed, using stem cells, in animal models by scientists at the Hebrew University of Jerusalem. Neural and behavioral birth defects, such as learning disabilities, are particularly difficult to treat, compared to defects with known cause factors such as Parkinsons or Alzheimers disease, because the prenatal teratogen  the substances that cause the abnormalities — act diffusely in the fetal brain, resulting in multiple defects. Prof. Joseph Yanai and his team at the Hebrew university-Hadassah Medical School were able to overcome this obstacle in laboratory tests with mice by using mouse embryonic neural stem cells. These cells migrate in the brain, search for the deficiency that caused the defect, and then differentiate into becoming the cells needed to repair the damage. The stem cells may develop into any type of cell in the body, however at a certain point they begin to commit to a general function, such as neural stem cells, destined to play a role in the brain/ nervous system. At more advanced developmental stages, the neural stem cells take on an even more specific role as neural or glial (supporting) cells within the brain/ nervous system. In the researchers animal model, they were able to reverse learning deficits in the offspring of pregnant mice who were exposed to organophosphate (a pesticide) and heroin. This was done by direct neural stem cell transplantation into the brains of the offspring. The recovery was almost one hundred percent, as proved in behavioral tests in which the treated animals improved to normal behavior and learning scores after the transplantation. On the molecular level, brain chemistry of the treated animals was also restored to normal. The researchers went one step further. Puzzled by the stem cells ability to work even in those cases where most of them died out in the host brain, the scientists went on to discover that the neural stem cells succeed before they die in inducing the host brain itself to produce large number of stem cells which repair the damage. This discovery, finally settling a major question in stem cell research, evoked great interest and was published earlier this year in one of the leading journals in the field, Molecular Psychiatry. The scientists are now in the midst of developing procedures for the least invasive method for administering the neural stem cells, which is probably via blood vessels, thus making the therapy practical and clinically feasible. Normally, stem cells are derived from individuals genetically different from the patient to be transplanted, and therefore the efficacy of the treatment suffers from immunological rejection. For this reason, another important avenue of the ongoing study, toward the same goals, will be to eliminate the immunological rejection of the transplant, which will become possible by taking cells from the patients own body — from a place where they are easily obtained — by manipulating them to return to their stem cell phase of development, and then transplanting them into the patients brain via the blood stream. One important advantage of this approach will be to eliminate the controversial ethical issues involved in the use of embryo stem cells. The research on the project has been supported by the US National Institutes of Health, the US-Israel Binational Science Foundation and the Israel anti-drug authorities. Stem cell cure for stroke in five years? Boston: Stem cell injections have potential to repair the human brain following a stroke, according to US doctors. Gary Steinberg at Stanford University has led the team of researchers who experimented with the brain cells of rats. They used embryonic stem cells and mixed them with natural chemicals, including growth factors.They then placed them into brain cells in hopes of helping stroke patients. They tested the injections of stem cells on rats that had strokes to come up with their results. They found that within two months they saw significant improvement on the part of the rats. It is expected that within five years the stroke victims brain damage would be fully recovered. London: A revolutionary new treatment will offer new hope for a group of people with Type 1 diabetes, the UK’s Health Minister Ann Keen announced today. From 1 April 2008, a specialised service at six centres across the UK will allow selected people with Type 1 diabetes to live free from the risk of blackouts and hospital admissions associated with hypoglycaemia. £7.32 million to meet the predicted annual need in the longer term. People receiving the treatment will be injected with insulin producing islets, taken from a donated pancreas. Each of them will have suffered from recurrent hypoglycaemia or have had a kidney transplant. Health Minister Ann Keen said: “In developing islet transplants for people who suffer from hypoglycaemia, the NHS is at the forefront of worldwide clinical innovation. This programme will ensure that people who have been unable to treat hypoglycaemia with conventional therapies will benefit from significant improvements to their quality of life”. Islet transplants have previously been offered to twelve patients in England under funding from charities, principally Diabetes UK. In the first year, it is expected that around 20 transplants will take place at the Oxford Radcliffe Hospitals NHS Trust, the Royal Free Hampstead NHS Trust, London, Kings College Hospital NHS Foundation Trust, London, Newcastle-upon-Tyne Hospitals NHS Trust, North Bristol NHS Trust and Central Manchester and Manchester Children’s NHS Trust. The service will then expand to meet the predicted annual need of approximately 80 transplants in subsequent years. Islet transplantation is a suitable alternative to whole organ pancreas transplant as it is less invasive and can be considered for patients with cardiac disease who would be unfit for open surgery. 1. Hypoglycaemia is the medical term for low blood glucose. 2. Diabetes is a long-term condition where the body is unable to control the amount of glucose in the blood. Type 1 diabetes develops when the body cannot produce the natural hormone insulin. 3. The National Commissioning Group (NCG) considers applications from providers of very highly specialised services for national designation and central funding and where appropriate make recommendations to the Secretary of State. Currently NCG nationally designates 38 very highly specialised service at over 50 NHS Trusts and funds 37 of these services. In 2007/08 the NCG programme budget is #346m per annum. 4. The six centres in England receiving national designation and funding from NCG are: Kings College Hospital NHS Foundation Trust; Royal Free Hampstead NHS Trust; Oxford Radcliffe Hospitals NHS Trust; Newcastle-upon-Tyne Hospitals NHS Trust; North Bristol NHS Trust andCentral Manchester and Manchester Children’s NHS Trust. An integrated hub-and-spoke programme will be established whereby islets will be prepared in the specialised central clinical laboratories in London and Oxford for distribution to the six regional transplant centres. – quote 29335 and the title. 7. Residents of Wales, Scotland and Northern Ireland will be treated in English centres. The National Services Division in Scotland (equivalent of the English NCG) will be considering a transplant centre in Edinburgh to start in April 2009. Can infra red light grow new brain cells to reverse Alzheimer’s? London: A scientist has claimed that an experimental helmet whch bathes the brain in infra-red light is capable of stimulating the growth of new brain cells in patients with Alzheimer’s disease. The creators of the helmet, a County Durham, UK-based medical research company called Virulite, say that ten minutes use daily over a period of four weeks can reverse the symtoms of dementia. Dr Gordon Dougal, a director of Virulite, bases the claims on a study at the University of Sunderland which found infra-red light can reverse memory loss in mice. Dr Dougal says that the treatment not only stops brain decay but partially reverses it. The study at Sunderland found that exposing middle-aged mice to infrared light for six minutes a day for ten days improved their performance in a three-dimensional maze. In the human trials, due to start this summer, the scientists will use levels of infra-red that occur naturally in sunlight. Boston: Scientists in the US are a closer to creating artificial blood vessels after growing tiny tubes out of stem cells. The Massachusetts Institute of Technology team were able to create cells that formed tubes along a grooved template. Now they plan to produce capillaries which could be tested in animals, according to a report in the magazine Advanced Materials. Researchers have already managed to make larger blood vessels , but the creation of tiny capillaries is far more difficult. The US scientists claim to have made progress towards this, using a “nanoscale” template into which stem cells called endothelial progenitor cells are placed. The cells detected the grooves and elongated themselves along them, aligning themselves in the same direction. Adding a gel made of growth factors allowed the cells to grow outwards, forming a series of tiny tubes running parallel to each other. While these tubes are not yet ready to be put inside a human body, the researchers say they are “very excited” by their potential. The team now plan to develop capillary tubes which can be inserted into animals to see if they work properly. The technology may also have other uses such as preventing unwanted growth in cancer and tumours. US company Cryo-Cell has launched a bank designed for women who want to store their own stem cells, taken from the menstrual blood, as a future health insurance. Stem cells can be obtained from numerous sources, including the blood, bone marrow and embryos. And a number of private companies, including Richard Branson’s Virgin Health Bank, already offer umbilical cord blood banking for about £1,500. Cryo-Cell charges a sum of $499 (£238) for processing and a year’s storage of menstrual stem cells. The woman is sent a collection kit in the post, comprising a cup, collection tubes and a prepaid return shipment to Cryo-Cell. Menstrual stem cells – which form in the womb lining whichis then shed during a woman’s period – have the advantage of being easily harvested in a painless, non-invasive manner as compared to some other stem cell sources such as bone marrow. And like other stem cells, early lab work suggests they too have the potential to turn into many other types of cell, including heart, nerve, bone, cartilage and fat, the company claims. Spokesman for the company, stem cell expert Dr Stephen Noga, director of the Cellular Therapeutics Program, at Sinai Hospital of Baltimore, said: “Even one menstrual cycle has the potential to produce millions of stem cells. Cryo-Cell says on its website that “realistically, it may take several years for these menstrual stem cells to be developed into potential widely-available commercial therapies”. New York: United States researchers have come up with a novel use for men’s testicles, which they say are a rich source of stem cells and so could be transformed into a wide range of tissue types to help fight disease. mice, extract them and reprogram them into blood vessels, heart cells and tissue. If the results are reproduced in humans, the technology could help get around the ethical concerns associated with the use of embryonic stem cells and could be used to help treat Parkinson’s, heart disease, strokes and cancer. Shahin Rafii from Weill Cornell Medical College in New York whose research has been pubished in the journal Nature said: “Testes are designed to generate a lot of sperm and they have these germ cells. So it is a possible breakthrough, albeit somewhere down the track, for men. But Dr Rafii says women need not give up hope. “In women also this stem cell exists but the number is very, very low and we hope that eventually we can be able to get these stem cells from their ovaries as well,” he said. Cambridge: Some humans have cancer fighting cells which may be used to fight the disease in others. Dr Zheng Cui, of the Wake Forest University School of Medicine, whose work has been published in the latest issue of the New Scientist magazine, has shown in laboratory experiments that immune cells from some people can be almost 50 times more effective in fighting cancer than in others. Dr Cui has previously shown cells from mice found to be immune to cancer can be used to cure ordinary mice with tumours. These cancer-killing immune system cells are called granulocytes which could be made available from donors to significantly boost a cancer patients ability to fight their disease, and potentially cure them. In the US, the Food and Drug Administration (FDA) last week gave Dr Cui permission to inject super-strength granulocytes into 22 patients. Dr Cui believes patients could benefit from the technique quickly because the technology used to extract granulocytes is the same as that already used by hospitals to obtain other blood components such as plasma or platelets. Dr Cui, who presented his latest findings at an anti-ageing conference in Cambridge last week, extracted granulocytes from 100 people, including some with cancer. When the immune cells were mixed with cervical cancer cells, those from different individuals demonstrated vastly varying abilities to fight the cancer. Those of the strongest participants killed close to 97 per cent of the cancer cells in 24 hours, while those of the weakest killed only two per cent. The abilities of the cells of participants aged over 50 were lower than average, and those of cancer patients even lower. Dr Cui noticed that the strength of a persons immune system to combat cancer can also vary according to how stressed they are and the time of year. Initial experiments suggest it may be possible to transfer granulocytes which have demonstrated strong cancer-fighting powers into cancer sufferers. In 1999 Prof Cui and colleagues discovered a male mouse that appeared to be completely resistant to virulent cancer cells of several different types. Since then more than 2000 mice in 15 generations have been bred from the original cancer-free mouse and 40 per cent of the offspring have inherited the immunity. With the immune system, some types of cells which provide innate immunity are constantly on patrol for foreign invaders, while others have to firstly learn to identify a specific threat before going on the attack. Scientists developing cancer vaccines have generally attempted to stimulate responses in the immune system cells that require prior exposure. Last year Dr Cui caused shockwaves in the cancer research community when he identified granulocytes as the cells responsible for the mouse cancer immunity  because they are among those which act automatically. Prof Cui injected granulocytes from immune mice into ordinary mice, and found it was possible to give them protection from cancer. Even more excitingly he found the transfusions caused existing cancers to go into remission and to clear them completely within weeks. A single dose of the cells appeared to give many of the mice resistance to cancer for the rest of their lives. Granulocyte transfusion has previously been used to try to prevent infections in cancer patients whose immune systems have been weakened by chemotherapy. However their effectiveness has been unclear because they have mainly been given to patients in an advanced stage of disease. Prof Gribben warned the US researchers would have to be careful to avoid other immune system cells from the donor proliferating in the patients body. But Dr Cui said he is working on ways to minimise this risk. Stockholm: Lung cells grown from mouse embryo stem cells have been successfully implanted into the lungs of mice, a breakthrough that could one day help humans with sick lungs, say researchers. The experiment was conducted by a team of scientists from London’s Imperial College and is a “global breakthrough” that “opens up exciting new horizons for the treatment of lung disease,” a statement from the European Respiratory Society’s (ERS) annual congress in Stockholm said. In the experiment, the researchers injected lung cells cultivated from embryonic stem cells into the mice’s lungs. Two days later, they killed the rodents and found that the lung cells had lodged themselves in the animals’ lungs, demonstrating the “high degree of specialisation of these cells, which attach only to their target organ, ie. the lungs,” the statement said. Embryonic stem cell therapy has given rise to hopes for the treatment of many conditions and could one day help repair organs, such as a heart damaged by a heart attack. Experiments suggest stem cells could also yield effective treatments for Parkinson’s and Alzheimer’s disease, spinal cord injury, diabetes, osteoarthritis, and numerous other illnesses. But lung diseases have not yet benefited from stem cell research. One of the great challenges of cell biology is figuring out how stem cells remain unspecialised or “pluripotent,” maintaining the capacity to become virtually any type of cell found in blood, nerves and individual organs. “The lung is a very difficult target for tissue engineering researchers … especially since it is an extremely complex organ and contains a large variety of cells, some of which have a very slow renewal rate,” researcher Sile Lane of Imperial College said in the statement. According to the ERS, respiratory diseases are the main cause of death in the world. In Europe, respiratory diseases cost society more than 100 billion euros (140 billion dollars) a year. A total of 15,000 clinical doctors, researchers, physiotherapists and medical and pharmaceutical industry workers from more than 100 countries are attending the congress in Stockholm, which concludes on Wednesday. Even though bones seem to be metabolically inactive structures, nothing could be further from the truth. In fact, bones are rebuilt constantly through the action of cells known as osteoblasts while old bone is destroyed by other cells known as osteoclasts. Bones also produce red and white blood cells, help maintain blood pH and store calcium. However, exciting new research published in this month’s edition of the magazine Cell, has shown that bones also act as an endocrine organ. Not only do bones produce a protein hormone, osteocalcin that regulates bone formation, but this hormone also protects against obesity and glucose intolerance by increasing proliferation of pancreatic beta cells and their subsequent secretion of insulin. Osteocalcin was also found to increase the body’s sensitivity to insulin and as well as reducing its fat stores. Hormones function as chemical messengers that allow the body to precisely coordinate metabolism, reproduction and other essential biological processes that involve multiple organs. “The skeleton used to be thought of as just a structural support system. This opens the door to a new way of seeing the bones,” said Dr. Gerard Karsenty, chairman of the department of genetics and development at Columbia University Medical Center in NYC, who headed the team that made the discovery. Osteocalcin is not new to science: Its existence has been known for 50 years, “but its function was never understood,” observed Karsenty. However, researchers have long known that people with diabetes tend to have low levels of osteocalcin, but until now no one understood the significance. Based on their knowledge of skeletal biology and endocrinology, the research team hypothesized that there might be a relationship between skeletal biology and endocrine regulation because of the long-known observation that obesity protects against osteoporosis in mammals. Additionally, it was known that people with untreated type 2 diabetes have low osteocalcin levels, which made this hormone an appealing target for their research efforts. To do this research, the scientists designed an elegant series of experiments using several groups of mice. The first group of experimental mice had their osteoblast gene, called Esp, genetically deactivated, or “knocked out”. Esp encodes a receptor-like protein tyrosine phosphatase called OST-PTP that increases beta-cell proliferation and insulin secretion in the pancreas, which results in hypoglycemia. But these so called “knock-out mice” lacked all functional Esp genes, so their insulin secretion and sensitivity decreased causing them to become obese and then to develop Type 2 diabetes when fed a normal diet. Type 2 diabetes occurs when the body becomes resistant to insulin, the hormone that regulates sugar metabolism. A second group of experimental mice were genetically engineered to over-produce osteocalcin. These mice showed lower-than-normal blood glucose levels and higher insulin levels than did normal mice that were fed a normal diet. Additionally, these “overproducer mice” also showed increased insulin sensitivity. This is probably the most exciting result because typically, excess blood insulin decreases tissues’ sensitivity to the hormone, which makes insulin treatment difficult for diabetics. Further, the team found that treating the “knock-out mice” with osteocalcin helped regulate their blood sugar and insulin. Interestingly, mice that are genetically programmed to overeat and mice that were fed fatty diets were prevented from suffering both obesity and diabetes when given high levels of osteocalcin. Karsenty is now determining whether giving osteocalcin to his diabetic “knock-out mice” will reverse the disease. This research shows promise for treating human diabetics as well. “The findings could have important implications for the treatment of diabetes. Osteocalcin has a triple-punch effect, in that it raises both insulin levels and insulin uptake while keeping fat at bay. That makes it a promising therapy for middle-aged people who want to fight type 2 diabetes,” Karsenty said. Additionally, this study also reveals that the skeleton is an important part of the endocrine system. “To our knowledge this study provides the first in vivo evidence that [the] skeleton exerts an endocrine regulation of energy metabolism and thereby may contribute to the onset and severity of metabolic disorders,” the authors wrote in their paper. London: The British biotech company Intercytex (ICX.L) with a market capitalisation of $98m (£50m, 76m) which floated on the UK’s Alternative Investment Market earlier this year, has an attractive pipeline of products within the anti-ageing and rejuvenation sector – all based on cell culture. Last year it secured a UK government investment of $3.72m (£1.9m, 2.87m) to develop a baldness cure by growing hair follicles for transplant. But it will be a while before this product comes to market, particularly since it needs the approval of the governments Medicines & Healthcare Regulatory Agency (MHRA). It is also growing human skin for the treatment of burns and other serious medical conditions such as ulcers. But the most interesting product which the company is already talking to cosmetic surgeons about is the worlds first anti-ageing skin rejuvenation injection made from human baby foreskins. These are the most potent skin cells it is so far possible to harvest  promising that the treatment will be far more effective than any other to date. And dont be deceived into believing that the yuk factor will put women (and even men) off trying it. A skin cream containing cells from a similar source has become a best seller in the US. What is different about this treatment is that the cells are immune silent which means they can be injected into anyone without allergic or immune reactions. They do not need the expensive individual storage conditions required for own cells. This makes the cost of bringing the treatment to market cheaper and it will cost only a few hundred pounds compared to the only similar product Isolagen, which used a persons own cells and was charging £4,500 in the UK because of expensive storage and was forced to close its operation last year. After positive results from efficacy tests on arms, the company now undertaking facial trials before treating its first consumers. The global market for anti-ageing products and services is estimated at US $56 billion worldwide (£29.7bn, 43bn) so the potential for this product is enormous. A “natural” form of breast enhancement that uses stem cells and fat from a woman’s own body may soon be offered by cosmetic surgery clinics. Women in Japan have already had breast enlargements using the technique in trials. The breasts which are smoother and more natural are made from a person’s own stem cells extracted from their fatty tissue – usually from the thighs. The stem cells grow to become part of the breast. The process has already been given approval in Germany which means, according to European law, it is legal in the whole of Europe including the UK. As well as cosmetic surgery the procedure has the potential to be used for victims of breast cancer and other disfigurements. Stem cells are already being used to repair hearts and other organs in experimental procedures. It also has the potential for degenerative diseases such as Parkinson’s Alzheimer’s, muscle wasting and motor neurone disease. The new breast augmentation uses an extraction method developed by Californian company, Cytori, which is able to extract and concentrate cells in hours making it more available to more people. The process concentrates the number of stem cells. This particular procedure has been pioneered by Tokyo surgeon, Kotaro Yoshimura, a surgeon at Tokyo University medical school. It gets over current disadvantages of silicon and water implants which can leak. Another method which uses fat alone does not last as the cells die. London: A new skin rejuvenation laser that peppers the skin with little holes, stimulating new collagen, has been launched in the UK. The Harmony Pixel is a new generation skin resurfacing laser that means long recovery times following treatment are a thing of the past. This exciting new fractional laser provides the dramatic effects of ablative skin resurfacing without the pain. Harmony Pixel offers safe and effective skin resurfacing for face, neck, chest, arms and hands with no side effects, no down time and no pain. Harmony Pixel reduces fine lines and pigmentation in a non-aggressive way that targets about 20% of the skin surface at one session making it possible to re surface sensitive areas such as around the eyes, the neck and hands. Redness lasts 2-3 days rather than 1-2 weeks with traditional laser resurfacing. The Pixel® Erbium laser is a pre-programmed laser beam that passes through the pixel micro optic lens, splitting the beam into tiny dots which penetrate into the skin. It creates an ablative effect at the pixel area – a micro injury – without disturbing any surrounding tissue. The micro injured areas then start the process of healing as collagen remodels, skin tightens and the skin texture improves. The Pixel® used at the Court House Clinics has also proven effective in reducing acne scars and treating younger skin for superficial sun damage. The treatment itself is not painful and no local anaesthetic will be required. Following treatment you can expect to experience a mild ‘sunburn’ type sensation for 3 – 4 hours, then virtually no discomfort at all. No pain medication is required and you can return to work within 1 – 2 days. 2-3 sessions 4-6 weeks apart may be required, but with less downtime and discomfort Pixel is a real break through for smoother, softer and tighter skin. Prices: £1,200 per full face treatment, I hr per treatment.£500 per area. Time: 45 minutes for first treatment and 30 minutes for subsequent treatments. Israeli scientists have successfully grown powerful adult stem cells from those circulating in the blood and returned them to revitalise the hearts of ailing patients. The details of the clinical trial will be announced at the American Heart Association Scientific Meeting in Chicago later this week. The results give new hope to seriously ill heart patients. Members of the AHA will be given an abstract of clinical trial results that conclusively demonstrate the efficacy of adult stem cell treatment for end stage cardiac patients. TheraVitae, the acknowledged leader in stem cell research and development is to present recently concluded trial results that provide dramatic data revealing the improvement in the lives of seriously ill patients. The founder of Theravitae, Don Margolis, said that a mere half pint of each patient’s blood was extracted in Bangkok and flown to their laboratory in Israel. There, the few adult stem cells were harvested into millions of such cells. A week later those infinitely more powerful cells were injected non-surgically into the patient’s cardio-vascular system. Standard cardiac measurements and the patients’ own words give eloquent testimony to the positive outcomes of harvesting stem cells from these seriously ill cardiac patients. Margolis is upbeat that patients can receive the best hospital care available anywhere in the world and a significant number can then return to a new, more normal and healthy life. These findings give new hope to sufferers via clinically proven mainstream medical methods. The body has natural ways of healing itself and the cardiovascular system is no exception. Angiogenic Cell Precursors (ACPs) originate in bone marrow and then circulate in the blood vessels. To manufacture VesCell, TheraVitae expands a small number of ACPs harvested from about 250cc of blood into a therapeutic quantity. VesCell is injected either through a coronary artery via catheter, or during surgery, directly into the heart muscle. A key aspect of VesCell therapy is the advanced cell isolation and expansion technique that allows for the ACPs to be harvested from blood collected in a procedure similar to a common blood donation. VesCell uses a patient’s own adult stem cells to treat Heart Disease and is a viable therapeutic possibility for heart patients without any other treatment option. TheraVitae is a private, multinational company focused on using stem cells from the patient’s own blood in order to treat a variety of disorders, especially cardiovascular diseases. The company has already developed a proprietary stem cell technology ‘VesCell’ that is currently being used by hospitals in Thailand to treat patients with Heart Disease. TheraVitae is based in Bangkok, Thailand, Kiryat Weizmann, Israel, Toronto, Canada, Singapore, Taipei, Taiwan and Hong Kong. Manchester: UK hospital maternity units should not encourage commercial banking of umbilical cord blood, argues a senior doctor Instead, women should be encouraged to donate altruistically to public blood banks. Umbilical cord blood is rich in stem cells that can be used to treat diseases such as childhood leukaemia. Bone marrow is used for this purpose, but cord blood is cheaper and easier to obtain and less likely to trigger a harmful immune response or rejection in the recipient. Cord blood banks generally fall into two groups. Public banks collect cord blood which has been altruistically donated. The blood is used to treat unrelated recipients or is collected from families with a known genetic disease that is treatable by blood stem cell transplantation. Since 1996, the NHS has been banking donated cord blood through designated public banks run by the National Blood Service and there is universal approval of the storage of this blood. In contrast, commercial (private) banks operate collection and storage of a babys cord blood for later use by that person or their siblings should they develop an illness. This just-in-case collection has been criticised by numerous medical bodies and is not recommended. Scientific arguments against commercial cord blood banking include the chances of the blood being used are very small, the alternatives such as bone marrow, and the speculative claims about how cord blood could be used to treat disease. Taking the arguments for and against into consideration, the balance is tilted strongly against NHS trusts collecting cord blood for commercial banking. It should therefore be NHS policy not to facilitate umbilical cord blood collection by its staff, he concludes. WORCESTER, Mass: US scientists have used stem cells to slow vision loss in rats suffering from a similar disease to macular degeneration, says a report in the journal Cloning and Stem Cells. The finding supports the idea of trying the technique in humans suffering from macular degeneration — the leading cause of blindness in people older than 55, The Washington Post reported. Raymond Lund, then at the University of Utah, and Dr. Robert Lanza of Advanced Cell Technology Inc. in Worcester, Mass., started by developing a method of turning embryonic stem cells into retinal pigment epithelium cells, which nourish the eye’s light-sensitive “photoreceptor” cells, the newspaper said. In macular degeneration, the pigment cells gradually disappear. The researchers said they succeeded in all 18 stem cell lines they worked with, injecting the stem cells, about 20,000 per eye, into the retinas of 14 rats with a genetic disease similar to macular degeneration. Eight control rats received eye injections without any cells. The scientists found treated rats were twice as responsive as untreated ones, which started to become blind. The study also showed treated rats had twice the visual acuity of untreated rats nearly three months after treatment. London: British scientists have warned against the use of “unproven” stem cell treatments at foreign clinics. Fourteen medical charities have signed a statement warning of the dangers of such untested therapies. Signatories include Professor Colin Blakemore, chairman of the UK Stem Cell Funders Forum, Lord Patel, chairman of the steering committee for the UK Stem Cell Bank, and Simon Gillespie, chief executive of the MS Society. Many people with serious chronic illnesses such as Parkinson’s Disease and multiple sclerosis are paying substantial sums for potential cures using stem cells, although the experts say there is no evidence that they can be cured. The experts say these patients put themselves at risk of infection and even cancer as a result. Stem cell research is still in its earliest days. And in the UK body parts are only used for certain cancer treatments, skin grafts, immune system disand cornea. Treatments which can cost thousands of pounds involve injecting cells at various points of the body where they are said to replace and repair damaged tissue and patients claim they have been life transforming. Human Genetics Commission – The UK Government’s advisory body on new developments in human genetics and how they impact on individual lives. Gives the Government advice on human genetics with a particular focus on the social, ethical and legal issues. One of its key roles is to promote debate and to listen to what the public and our stakeholders have to say. The Human Fertilisation and Embryology Authority is the UKs independent regulator overseeing safe and appropriate practice in fertility treatment and embryo research. New York: Scientists have developed a technique for extracting human embryonic cells without destroying embryos, according to a report in the magazine Nature. The method appears to get round a basic ethical objection to stem cell research and is the same procedure used in IVF when one cells is removed to analyse for genetic diseases. Dr Robert Lanza, vice president of US biotech group Advanced Cell Technology and leader of the tema involved said there is no rational reason left to oppose this research. Researchers from Advanced Cell Technology have generated stem cell cultures by plucking individual cells from newly fertilized embryos, which are not harmed. The new technique would be performed on an embryo when it is two days old, after the fertilized egg has divided into eight cells, known as blastomeres. In fertility clinics, one of these blastomeres can be removed for diagnostic tests, such as for Down’s syndrome, and the embryo, now with seven cells, can be implanted in the mother if no defect is found. Up to now, stem cells have been derived from slightly older embryos. Harvesting these cells destroys the embryo. Last year, Lanza reported that embryonic stem cell cultures could be derived from the blastomeres of mice. He now says the same can be done with human blastomeres. Hardline critics of embryo research, however, are unlikely to accept the manipulation even of a single embryonic cell, which they say could theoretically become a human being. US President George W. Bush last month vetoed a bill that would have required the federal government to fund experiments with newly created human embryonic stem cells.